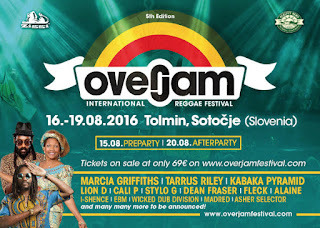 Tarrus Riley, Marcia Griffiths, Kabaka Pyramid, Cali P, Dean Fraser, Alaine, Stylo G, I-Shence, Fleck, Lion D, Madred, Asher Selector, Earth Beat Movement and Wicked Dub Division are the first names confirmed for the fifth Overjam International Reggae Festival, to be held in Tolmin (Slovenia) 16 to 19 August. These first confirmations are only a taste of the high level of the line-up this year, which includes veterans and young high-level international artists. Coming straight from Jamaica Marcia Griffiths, the Empress of Reggae music, which continues to shine after more than fifty years of concerts, both as solo, together with the I-threes and Bob Marley and in duo with Bob Andy. Other Jamaicans confirmed so far are Tarrus Riley, one of the most famous and representative singer of the second generation of roots, accompanied by the legendary saxophonist Dean Fraser and the beautiful voice of Alaine; and Kabaka Pyramid, one of the leading exponents of the so-called Reggae Revival. The four-day festival will be integrated with a preparty on August 15 and an afterparty on August 20 along the beautiful beach looking out on the Soca and Tolminka rivers, as well as from additional activities for children and adults throughout the whole event. Season tickets are on sale on the official website overjamfestival.com just € 69 until March 21, The spring offer at 79 € starts from March 22. Camping is free and it all takes place in the beautiful natural surroundings of the Soca River, on the border of the Triglav National Park, that unites Italy, Austria and Slovenia. La quinta edizione del festival sarà dal 16 al 19 agosto Tarrus Riley, Marcia Griffiths, Kabaka Pyramid, Cali P, Dean Fraser, Alaine, Stylo G, I-Shence, Fleck, Lion D, Madred, Asher Selector, Earth Beat Movement e Wicked Dub Division sono i primi nomi confermati per il quinto Overjam International Reggae Festival, che si svolgerà a Tolmino (Slovenia) dal 16 al 19 agosto. Queste prime conferme sono solo un assaggio dell’alto livello della line up di quest’anno, che include sia nomi storici, che giovani di alto livello internazionale. I quattro giorni di festival verranno completati da un preparty il 15 agosto e un afterparty il 20 sulla magnifica spiaggia che affaccia sui fiumi Soca e Tolminka, oltre che dalle attività collaterali per piccoli e grandi durante tutto l’evento. Gli abbonamenti sono in vendita sul sito ufficiale overjamfestival.com a solo 69€ fino al 21 marzo, mentre il 22 inizierà l’offerta di primavera a 79€. Il campeggio è gratuito e il tutto si svolge nello splendido contorno naturale del fiume Soca, ai confini del Parco Nazionale del Triglav, che unisce Italia, Austria e Slovenia.